World Wildlife Fund officially released the new and dramatically improved WildFinder II. This new version showcases ArcGIS Server 9.3.1, Adobe Flex, and Google Maps Flash API, which when combined, deliver a superior user experience. Blue Raster is proud to work with WWF to bring Web 2.0 technologies to the forefront of wildlife conservation. The Wildfinder application was designed by Blue Raster LLC and lets users explore what species live where and select and print quick-maps of global diversity patterns. 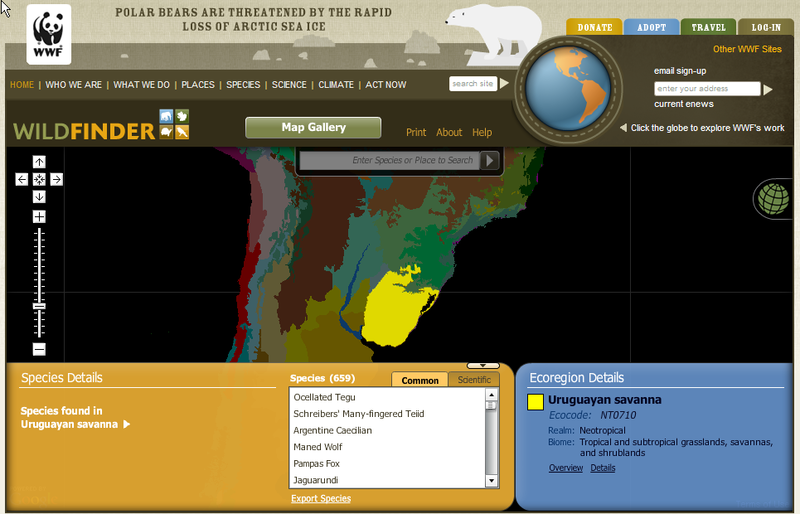 The application incorporates WWF’s searchable species distribution database and information on these species into a user-friendly tool that will help conservationists target their efforts worldwide, scientists study global patterns of species diversity, teachers build curricula, students learn more about ecosystems and species, and nature enthusiasts plan excursions. You can access the WildFinder at https://www.worldwildlife.org/pages/wildfinder. Since science is constantly revealing new information about the world around us, new data will constantly be loaded into Wildfinder to provide the most comprehensive database of species diversity on the internet.